As mentioned previously, an article in Newscoop can have one of four different states: New, Submitted, Published, or Publish with issue. When you create an article, the Status: drop-down menu at the top of the editing area is set to New by default. Once your article copy has been drafted and is ready for the editors to see, click on this drop-down menu and change the Status: to Submitted. After changing the status to Submitted, the page will be reloaded, and a pop-up message will indicate that the change in status of the article has been saved. The editors will be able to see the fresh submission when they log in to Newscoop. Articles which are ready for editing are listed in the Submitted Articles view on the Dashboard. In addition, if their user accounts have been configured for notifications, an email will be sent to the editors to inform them about the new submission. Once the editors have made any required changes and are happy with the way the article reads and appears, they can publish the article by changing the drop-down Status: menu to Publish with issue. Again, the page will be reloaded, and a message will indicate that the article's status has changed. When an article status is set to Publish with issue it becomes visible on your public web site, as soon as the issue it belongs to is published. This feature enables co-ordinated publishing of complementary articles when a complete issue is ready for the public. 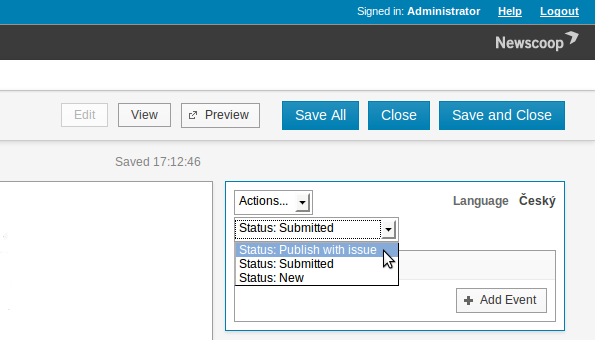 You can check the publication status of a particular issue in the Issue List. If the issue in question has already been published, then new articles can be seen by the public immediately after their status is changed to Publish. The process is fully reversible, so you can unpublish articles on your site (or even change their status to New) as easily as you can publish them. Note that only authorized users are allowed to publish articles, so you will not be able to access this option if your system administrator has not granted you this permission. 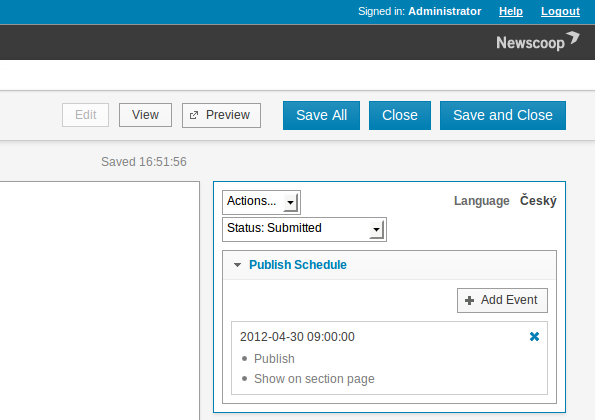 You also have the option to publish (or unpublish) an article at a specific date and time in the future. 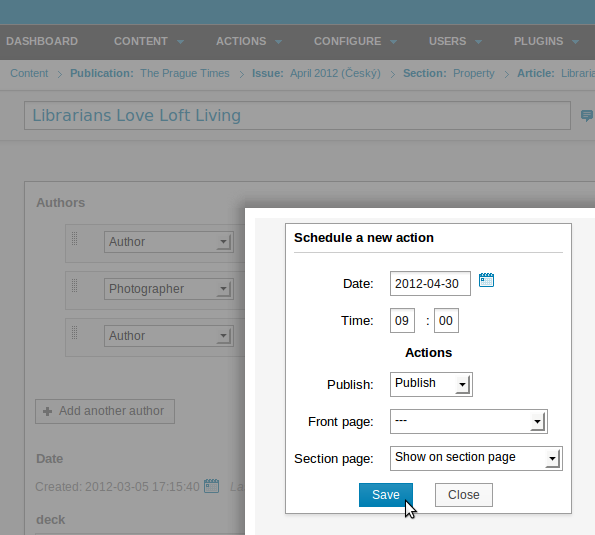 You can do this from the Edit article page, using the Add Event button in the Publish Schedule box. After clicking on Add Event, a pop-up window will appear with a calendar and a series of three possible actions for the date and time that you choose: Publish/Unpublish, Show on front page/Remove from front page, and Show on section page/Remove from section page. Choose the date by clicking on the calendar, or enter a date code manually. Then enter the time for the event, and choose one or more actions to perform at the time you have chosen. 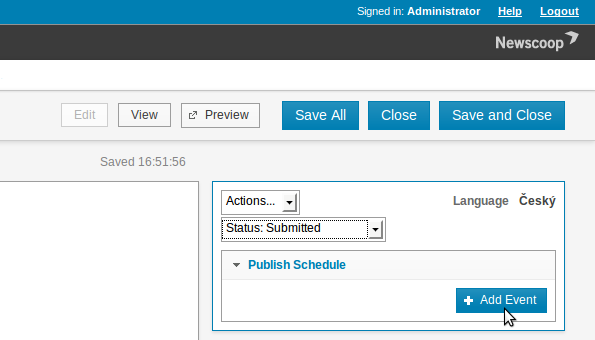 After you click the Save button, the pop-up window will close, and the event will appear in the Publish Schedule box. Once the event is created, the actions will be performed automatically for you on the date and at the time you specified. After the event time, the Status drop-down menu will change to Published, and the event will no longer be shown in the Publish Schedule box.